Consider fitting Ultion security cylinders to your doors to replace traditional mortise locks. The euro Ultion cylinders are approved by insurance companies and police and offer a high security option that can fit onto any wooden type door to provide a truly high security option were peace of mind are assured. In this instance the Ultion is protected further with the edition of Union security escutcheons. These not only look great but offer editional protection to the lock and lockcase ensuring that any intruder will be deterred. The Ultion comes with a coded key system that is unique to the lock fitted. The owner can register his key details with Ultion offering further protection should further keys be required. In addition the Ultion locks can be suited. If more than one lock is needed the entire system of locks can be keyed in such a way that all the locks can work with the same key. In fact you could have for instance 5 locks one of which is a yale type lock and any number of keys all of which will work in all locks. Another bonus is if another lock is required. An Ultion can be made up to your key requirements. 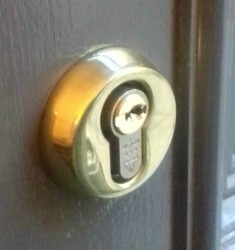 So instead of buying a totally different lock with different keys your new lock can be configured to work with your existing locks resulting in no additional keys to carry about. This can also work with second home lock requirements or sheds and outbuildings. In this case the owner of the home wanted to do away with his mortise locks on the door in which he had 3 of them. After speaking to the owner we decided to keep the middle mortise because it was a sash mortise and the latch would be used to line up the door and allow the newly fitted lock to work unrestricted. So for this A.L.S. Locksmith fitted a Union 20mm euro deadbolt lockcase and Union security escutcheons. The Ultion was fitted and 6 keys were cut to code. In the door frame a full steel security keep was fitted. The lock, escutcheons and Ultion were all fitted by A.L.S. Locksmith from scratch leaving a very neat job.